Fire pits are an attractive addition people will install on their property. Not only do they add warmth, but they also add style and even enhance the value of your property. However, as fun as they are, fire pits can be dangerous if you don’t properly manage them. If you decide to add a fire pit to your yard, make sure you take the necessary safety precautions. Here are some tips on how to do so. While having the fire pit close to your house can be convenient, placing it any closer than 10 feet from the structure can be unsafe. It is recommended that the fire pit is placed 25 feet away from buildings and neighboring yards, though 10 feet will do if necessary, according to a former firefighter. When picking your fuel source, you have a few different options to choose from such as wood or propane. Each has their pros and cons like wood’s natural smell and sound, or propane’s quick ignition. There’s no universal answer, so talk to a specialist and find out which fuel works best for your home. Make sure your fire pit is constructed on nonflammable land such as a cement patio or a dirt patch. Do not install your fire pit directly on a lawn. Additionally, clean up any other flammable materials like fallen leaves and twigs within 5ft of the pit and be aware of anything downwind that could catch fire if an ember was to escape the fire pit. If it’s too windy outside, you should rethink having that fire. Small and medium pits are not meant for large bonfires and will not be able to contain them. Stay within the limits of your pit to ensure the flames are controlled and not allowed to spread outside. If bonfires are a function you are looking to get out of the feature, you’ll need to invest in a larger fixture. Accidents happen. If a fire starts to get out of control, put it out immediately. Never leave a fire unless you know it is completely out. Drown the flames in water and stir the pit with a shovel to smother all the embers. If you can see hot embers or the fire still hisses when you add more water, then it isn’t out yet. It is best to have a source of water like a filled bucket or garden hose nearby at all times when the fire pit is in use, just in case. 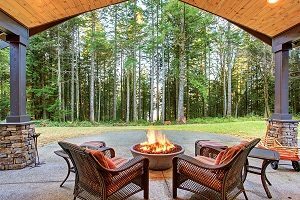 Now that you have a better understanding of safety precautions for firepits, it’s time for the fun part: design and construction. At Greener Horizon we offer a full range of landscaping services from hardscaping and stone work to installing features such as fire pits. We will help make your dreams come true by shaping your property just the way you want it. Contact us for help with your property and to request a consolation today!